Planning a road trip across America? Or are you thinking about living in a van full time? Well you're in for a hell of an amazing experience! Seeing the USA from the road is spectacular and allows you to reach some extraordinary places you wouldn't be able to visit by plane or tour bus. But that doesn't mean life on the road is always easy. Ask any van dweller or somebody who has already driven across America what the biggest challenge they encountered was, and the answer is almost always the same... Where will my next shower come from? ​If you are reading this post then you are probably wondering the same thing. Well, unless you are planning to rent out an RV that is already equipped with showering facilities or have it in your budget to stay in a hotel every night, being able to shower on a daily basis gets a little tricky. But it is possible! TIP: If you're wondering where you can pull over on your road trip and park overnight safely to get some sleep, read our blog post '7 Places You Can Park Overnight & Sleep On A Road Trip In The USA'. In order to gain great things (in this case the freedom of the open road and seeing places that are beyond incredible) you have to make a few sacrifices, and daily showering is one of them. You might only go a few days without showering or you might go weeks! It all depends on where you plan on visiting. If you are like us and love being outdoors and exploring hard to reach destinations, showers can be few and far between. Sometimes there is of lack of any nearby facilities, sometimes it is not in your budget, and sometimes it is because after a long day of adventuring you are just too tired to go on the never ending search for your next shower. ​I won't lie, this is probably one of the worst parts about road tripping (or living in a van). What's that you say? You can handle it? I assure you there will be a time when you will crack. When you no longer can handle being a dirt bag! But don't worry, after a few months on the road you learn a few tricks and we want to share this knowledge with you. Below is a list of 7 places that we use to shower when we are on the road. If you are driving across country, visiting national parks, visiting state parks, or you are just in the middle of nowhere, campgrounds are going to be your best bet for finding shower facilities because no matter where you are (so long as it's not the city) you are likely to pass a couple of them whether they are private or state owned. ​The privately owned campgrounds always have shower facilities and some can be quite luxurious with heating inside the bathrooms. They are usually not coin operated so feel free to take as long as you like! However, you will need to pay for a night of camping to gain access to shower's at private campgrounds. State campgrounds won't always have showers so you might have to check a few out before finding what you're looking for. You can usually pick up a state map from a visitor or welcome center with a list of campgrounds and the facilities they offer. You will either have to pay for a night of camping or you may be able to park outside of the campgrounds and just walk in to use the facilities. This amazing tip was originally given to us a few years ago by our lovely friend and fellow van dweller. Although now that #vanlife has grown in popularity, this idea of getting a gym membership to be able to shower regularly is very well known and a common method to use. ​So, if you are about to embark on a lengthy road trip and plan on taking several months to travel across the country, you should invest in a gym membership! All gyms have shower facilities. Some even have spa's and sauna's. Imagine having that to look forward to after a long day driving or after a few miles of hiking. There are many gyms that have locations throughout the country that your membership will be good for. Some gyms like 24 Hour Fitness are open 24 hours! Some even offer free trials. Gyms are also a great idea if you are urban camping (which means sleeping in your vehicle in the city or suburbia) or living in a van full time. And showering at the gym might even possibly motivate you to get fit??? We came up with this idea after we were tossing around the idea of joining a gym and decided that we didn't want to pay the expensive fees involved with gym memberships because at that time we weren't sure how long we would be hanging around civilization (and also because we got accustomed to going days at a time without showering). ​Anyway... we paid the local public swimming pools a visit because they always have showering facilities! They are a great idea if you're in the city or suburbs but don't want to commit to a 12 month membership. They are fairly inexpensive if you're only looking to shower once or twice a week. We have even found a few public swimming pools with water slides so they can be fun too. If you happen to be travelling along the coast, boat marina's are definitely somewhere you are likely to find shower facilities. The awesome thing about shower facilities at boat marina's is that they are super clean most of the time and some even have heaters inside the bathrooms. You might even come across some with laundry facilities. ​Boat marina's are a nice place to base yourself for a few days if you happen to be exploring in that area because not only do they have shower facilities, but most of the time they are set in gorgeous locations (especially along the Oregon and Washington coastline). ​Most of the shower facilities we have come across are open to the public but remember they are coin operated so keep some quarters in the car. Sometimes a code is needed to get in so if you are really desperate for a shower make friends with some of the residents on the dock and they might just share the code with you. It is important to remember to be respectful because these shower facilities are the personal bathrooms of local residents living on their boats. These are a welcome sight if you have been on the road for an extended period of time and have not showered in days! Pilot gas stations (which have been designed to cater for truckers) have showering facilities and can be found all over the country on highways and interstate roads. Their shower facilities are not cheap but if you don't plan to shower every day they are well worth it. For between $7-15 you will get your own bathroom for however long you want. These bathrooms are the equivalent of a five star hotel and even come with soap and shampoo. Pilot gas stations have coffee, snacks and offer hot food all for super cheap. Click on this link to check out Pilot's website if you want more information on their locations. ​A great alternative to finding shower facilities is to buy a portable solar shower system for your vehicle. They only require a one time purchase and you can shower whenever or wherever you want! ​Portable showers come in a wide range of styles to suit your needs. Prices vary from $10 to upwards of $100 depending on how efficient you want your system to be. See our top picks for portable solar showers below. If all else fails you can always stay for a night or two at a motel. This is usually a last resort for us as we like to try and save as much money as we can, but if you can afford it why not?! Sometimes you are just desperate for a shower. A shower where you can take as long as you want and don't have to worry about wearing flip flops or carrying around a bag with all your toiletries! And sometimes it's nice to just sleep in a real bed where you can watch television. ​Road-side motels in the USA can be fairly inexpensive ranging between $40 to $60. The cheapest motel chain is Motel 6. You can check out their website if you would like to see if they have any cheap rooms available where you plan to travel. 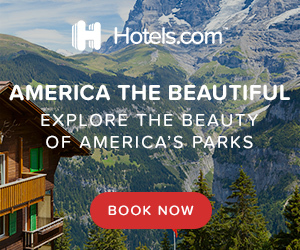 Another great website for finding good deals on hotel rooms is Hotels.com. They have a program where after you have booked 10 nights through them you will get a bonus night free.